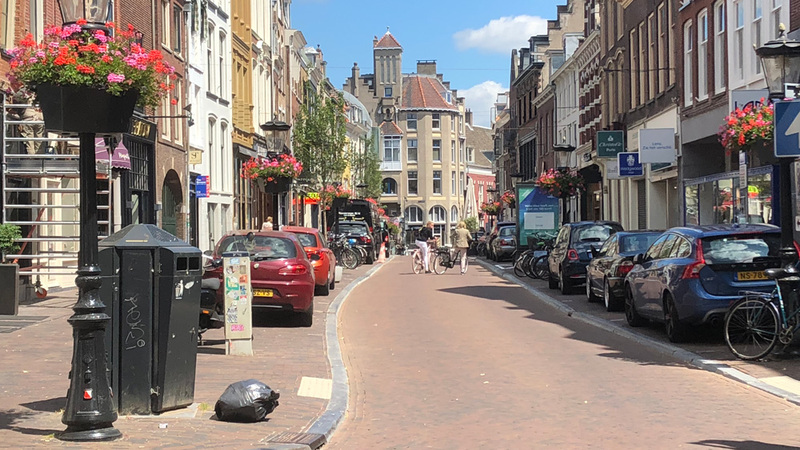 Retailers in the Utrecht shopping street Oudkerkhof are very pleased with how their street was reconstructed. Some seem to think it was done at their request. But this transformation was part of a much larger program that runs for years. 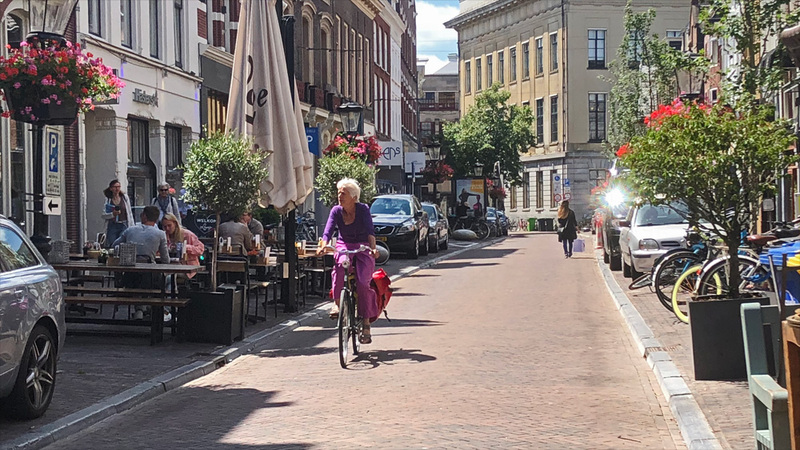 It is meant to upgrade the city centre of Utrecht by making it less accessible for motor traffic and much more attractive for people walking and cycling. Oudkerkhof after the reconstruction. The roadway is slightly wider than before. This makes cycling possible in both directions. The sidewalk became wider too, because 16 of the 24 parking spaces were removed. 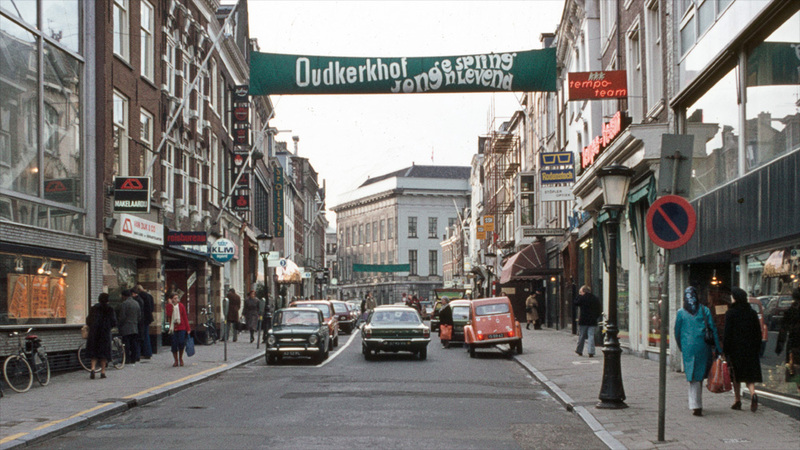 Oudkerkhof in 1976. The banner says it is “young and very much alive” but it had parking on both sides and really narrow side walks at the time. Not at all what the Dutch perceive as livable today. Picture Utrechts Archief. 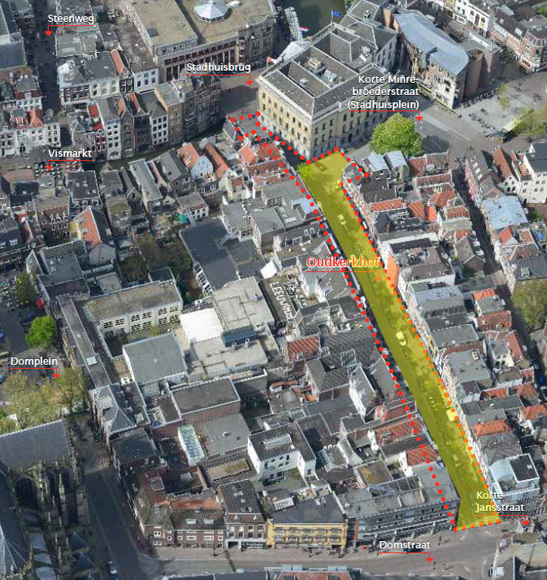 The cause for the reconstruction can be traced as far back as 2007, when many stakeholders in the Utrecht city centre held important public discussions about the desired development of the core of the historic city centre; the shopping heart of the city. The results of these discussions were documented in a report called “Discussienota Binnenstad” (Discussion report Inner-City). This vision formed the basis for the Inner-City Development Plan (Bestemmingsplan Binnenstad) that was adopted in February 2010. Both these important documents are the foundation of the reconstruction plan for the street Oudkerkhof that was finalised in March 2016. I have shown you a few other examples of streets that were reconstructed in the same area with the same principles and reports in mind. Mariaplaats and Twijnstraat for example. But most noteworthy in this case is Domstraat/Korte Jansstraat that Oudkerkhof leads to. Oudkerkhof in 2018 after the reconstruction. The 5 cars in the foreground (two on the left hand side and 3 on the right hand side) are on places that are not marked as parking spaces in the design. These 5 cars spoil the effect of an open sidewalk with sight lines to the shop windows. 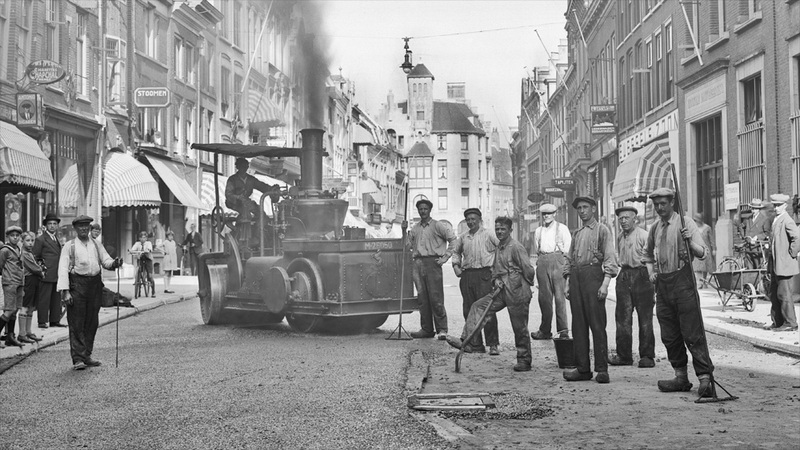 The street got a surface of asphalt in the early 1930s. At the time the roadway was much wider than it is today. This width of the asphalt surface remained unchanged until at least 1976, but more likely until the mid-1980s. Picture Utrechts Archief. The key point in the reports and all the redesigns is this. 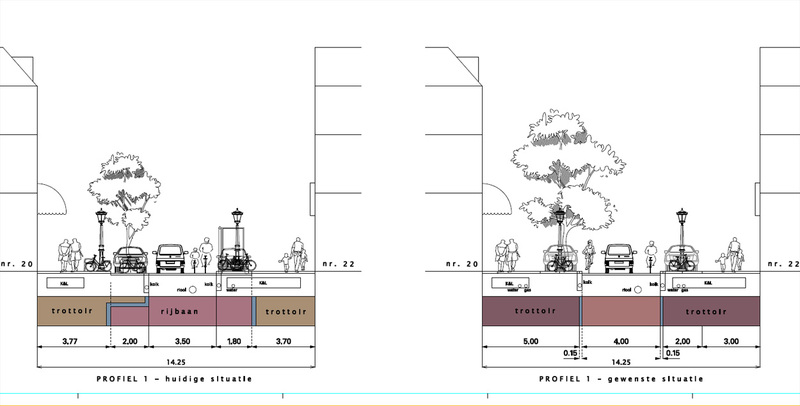 Utrecht wants its city core to be an attractive public space. A place that is the domain of people walking and cycling (in that order!) and where drivers of motor vehicles are guest. It is a pleasant area to live and work. That positive feeling is enhanced by how the area is designed. The street design improves the attractiveness of the city centre for visitors and thus improves the economic vitality of the area. It is a public space that the city is proud of. The city core of Utrecht. The pale yellow central area draws 25 million visitors a year. The dark yellow area about 2 to 5 million. By updating streets in that area the city hopes people will spend more time (and money) in that area in the future. Oudkerkhof (in red letters) is clearly an important connecting street. 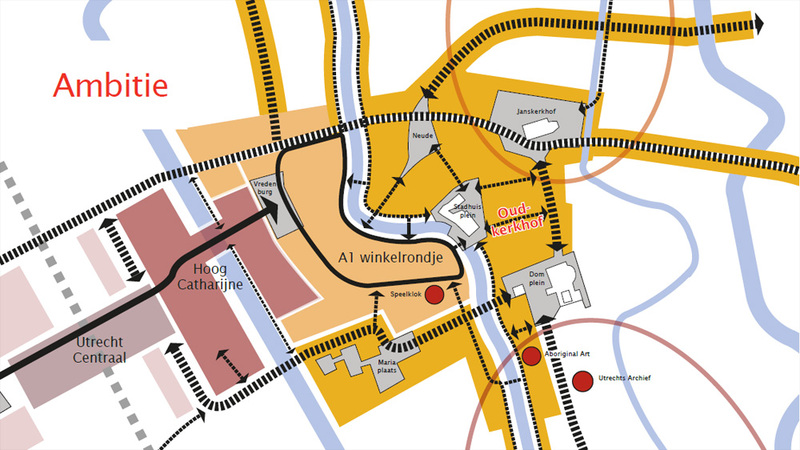 A map from the redesign of Oudkerkhof by the city of Utrecht (no longer available on the internet). 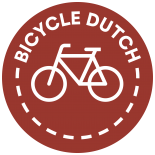 On average, the Utrecht city centre is visited by about 25 million people per year. At least the most important area with all the well-known international chains. That area is relatively small. Just outside that area we find a second ring with some nice squares and many more local shops. This is where Oudkerkhof is located. It is also the area of Dom Square with DomUnder, a museum about Utrecht’s Roman past, and Janskerkhof with its Flower market. This part of the centre draws much fewer people but still sees about 2 to 5 million visitors on average per year. By investing in the street design of this area the city hopes to make it attractive for people visiting the core to expand their visit to this area. Aerial picture of the city centre of Utrecht with Oudkerkhof highlighted. The design for the reconstruction. It is clear that there are no marked parking spaces on the left hand side (beginning of my video). The black dotted lines with arrows are there to indicate that people can roam freely there to visit the shops. Only 8 parking spaces remain (halfway, 4 on each side) and there is a loading bay on the right hand side with a parking space for disabled people on the other side of the street. In reality there are 5 more cars parked in the beginning of the street, where it is not allowed according to this map. Oudkerkhof means “Old graveyard” and that is because it is located where the city’s graveyard could be found between the years 690 and 780. The street is narrow (circa 14 metres wide) and had one travel lane for both motor traffic and cycling in one way of 3.5 to 3.7 metres wide. There were two parking lanes with a total of 24 parking spaces, one loading bay and one disabled parking space. This gave the feeling the street was still very much designed for motor traffic. The side-walk was about 3 to 4 metres wide. Very special about this street (for the Netherlands) is that it is a sloping street. There is a difference of 1.5 metres in height between the ends of the just 170-metre-long street. Before and after. The roadway is a bit wider, but the parking lanes are completely removed. The sidewalks are widened and at some locations cars can park on marked spots on that sidewalk. This is a deliberate choice. That way the space reverts to sidewalk when there is no car parked, not to roadway. Crosses and objects were added later where parking is not allowed, because drivers allegedly didn’t understand the sidewalk was not for parking. The entrepreneurs identified themselves so much with the redesign that they told a local newspaper the reconstruction was at their request to give the street a new grandeur. When the reconstruction was finished late 2017, they organised a street party for which they closed the street to motor traffic completely. There was a runway in the middle of the street where mannequins showed clothes you can buy in the shops here. Some drivers apparently have still not understood where you can park. Even a cross like this can be missed. Perhaps it is not so much being able to as it is being willing to understand. But soon after the party the atmosphere changed a little. There were many complaints that it wasn’t clear enough where you could park. Customers returning to their car found a parking ticket, not one, but hundreds. In the first half-year after the reconstruction 242 parking tickets were issued. A huge contrast to the 42 tickets in the entire year before. The shop keepers complained about this in the press. It led to questions from opposition parties to the alderman in the city council. The city admitted that it was apparently not clear enough where parking was allowed and where it was not. The alderman announced that measures would be taken. The open spaces created for walking would temporarily get objects to make parking impossible. The parking bays were marked more explicitly and the no-parking zones got a no-parking cross in the surface. However, if you go to the street today you can still see cars parked on such crossed out spaces. It may also be that drivers do understand about the no-parking regulations but that they simply choose to disobey the rules. They then whine and lie about the unclear situation. Dutch drivers are in no way different from drivers anywhere else. The before and after that was shown in the plans has not really come to live yet. The street doesn’t have the open atmosphere that is shown on the right hand side because cars are still parked at that location. On the day I filmed the 2018 after situation you can count 13 parked vehicles. That is 5 more than there should be. These wrongly parked cars make this redesign a bit less successful than the other examples I showed you. The before and after situations are not all that different because of it. The desired “open space” is not really there yet with wrongly parked cars filling it. I hope the enforcement will be kept up, so drivers are educated and the reconstruction can be more successful than it is so far. and after it was finished in 2018. That street seems to be full of fancy boutique shops now. Its almost as if Dutch gentrification leads to fewer cars, unlike in the UK where it leads to more Chelsea tractors. It has been my experience that it is truly amazing how swiftly private motor car drivers learn where it is illegal for them to park once the City begins towing away and impounding their cars. Another great post Mark. You’re fast approaching your 10th anniversary! As an aside, I would be interested in reading and hearing how the visually impaired are looked after in areas like this. For example, what measures are there to assist them at crossings and to stop them straying into a bike path when there is only a subtle slope separating a walkway from the bike path? In many countries (Australia where I live included) there are pavers laid with different tactile surfaces indicating different things. It’s hard to see for sure but I don’t see that sort of treatment in any of your photographs. Indeed, in some places such as where a pavement crosses a side road, there seems to be no warning at all. Is it because the engineering focuses on motorists or is there something else? The cleaner street surface looks nice but actually the areas designated no parking look like wasted space (and the crosses ugly). I think to allow brief parking (such as 5-10 minutes) for popping into a shop with clear signs and penalties for abusing the system would be better. Personally I wouldn’t want to encourage this (streets are much nicer when they are car-free!) but there are clearly plenty of (special) people who would benefit, and such a street is for everyone. I do see that some of these spaces are perhaps kept clear for access to premises but typically a business premises would cone off such a space prior to a delivery arriving, for example. Otherwise, a bench or two would occupy the spaces nicely. Reblogged this on Peerasak's Blog. A key point to me is that this is not pedestrianisation, but the road is traffic free as it is not a part of a through route. I also note the grade separation between road and pavement, vital for visually impaired people. In the UK they would have flattened this space into some sort of Frankenstein shared space then wondered why it was not working. 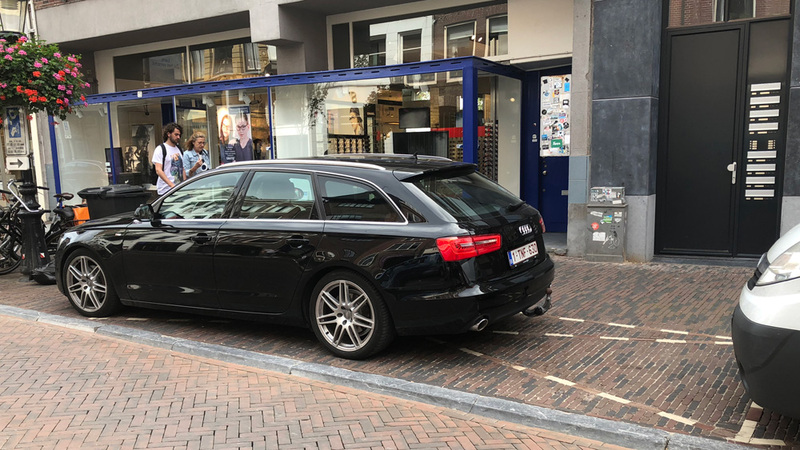 Interesting to note that even in the Netherlands there is a problem with parking. Regarding the five parked cars at the beginning: there are marks on the sidewalks which are used to indicate parking places (compare e.g. at 46 seconds and 55 seconds), and no crosses. So you can’t blame the drivers of these cars, but apparently the street designers have changed their plan. I suppose these extra parking tickets have been issued to people parking on the crossed spaces? Agreed. It appears there are four white bricks which seem to mark legal parking spots as Klaas pointed out. This American is already confused by parking on the sidewalk which is always illegal here no matter how wide the sidewalk is. Yes, people do it but there’s no sympathy or alleged confusion because its widely known that its illegal. I’ve seen sidewalk parking in several posts here and have always wondered if there is a standard appearance (i.e. white bricks at four corners, large letter “P”, signage, curb design, paver color difference, etc.) to indicate legal on-sidewalk parking? 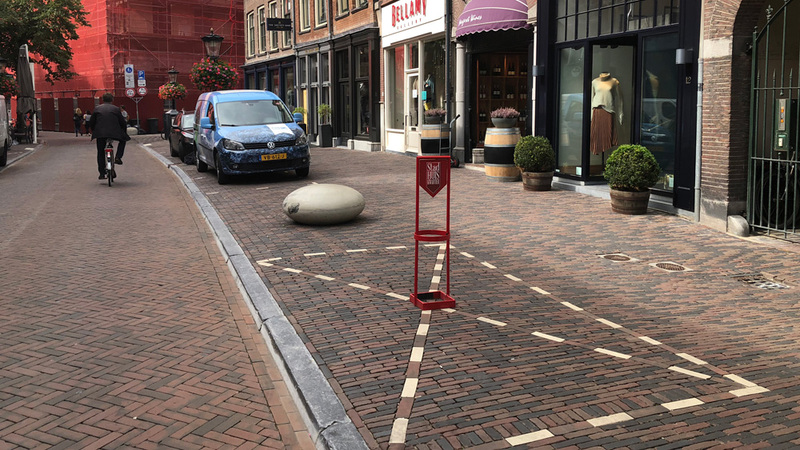 This entry was posted on 18 September 2018 by Bicycle Dutch in Original posts and tagged before and after, ride, urban design, Utrecht.